Olympic Music - Can you imagine the Olympics without Olympic Music? Without the music - the opening ceremonies would not have the same climax, the skaters would not express themselves with the same delight. Olympic Music is the soul of emotion that brings the crescendo of excitement to the games. What does it take for a musician to create Olympic Music and become an “Olympic Musician"? Seriously... we need to start a new category - OLYMPIC MUSIC - let the Music Games begin! Musicians are truly athletes of a very special kind. Not only do musicians require physical strength, mental preparation and emotional depth of expression, but working towards our goals - including creating Olympic Music - begins with three powerful words. The first word is DESIRE. One must first have a DESIRE to become a musician. Sometimes we are motivated by someone we admire and want to emulate that person. What can help us fulfill our desire to become a great musician? Goal Setting: As with all athletes we must set goals, however big or small, outlining what we want to accomplish. Why do you want to play an instrument or sing? Setting goals is the greatest motivation for achievement. That’s why athletes train so hard for the Olympics. Because it’s a personal goal, it's a challenge, and it’s fun. Become an Olympic Musical Athlete - Begin with a Goal - And work towards completing that goal every day of the Winter (Musical) Olympics. How many FLASHCARDS can you name in 5 minutes? Chart your progress. Try to beat your best time. What is your goal: 10 Flashcards? 15? 20? Set your timer and play the Music Theory App for 5 minutes everyday. At the end of the Winter (Musical) Olympics, what medal did you earn? Gold - you met, achieved and exceeded your goal every day. Silver - you met and achieved your goal every day. Bronze - you almost achieved your goal every day. Get your Music Theory App Buy Music Theory App Now and let the Olympic Music Games begin! 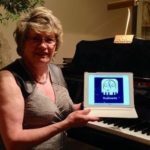 "Last Saturday my 8 year old student started to cry at the piano lesson because he just couldn't clap a rhythm in the sight reading book - nothing I said could console him! Then I remembered reading your email about a student who had a bad day! I quickly brought out the iPad and clicked on your Music Theory App. His face lit up and we were able to finish the lesson on a good note!" Use the Ultimate Music Theory Theory Flashcards App with 6 Subjects and Over 7000 Flashcards including audio! PLAY – Sight Reading and Ear Training Games and much More! Students will LOVE hearing exact pitch and pronunciation of terms. Students will be INSPIRED to use their imagination while building a foundation in Ear Training and Sight Reading. Get The UMT Flashcard App! The One and ONLY Music Theory App & Matching Workbook! Teach With Passion... Enriching Life Through Music Education! 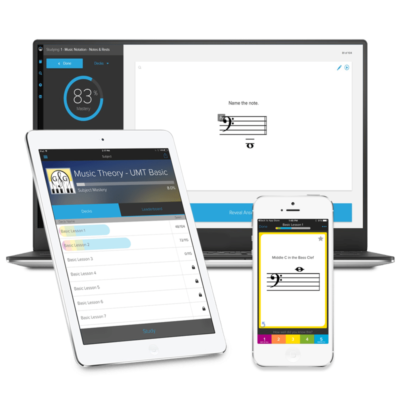 Become a UMT member today and get full access to ALL our Music Theory Resources!